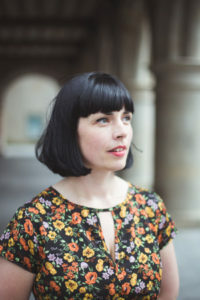 Doireann Ní Ghríofa is a bilingual Irish writer, born in Galway in 1981. She writes both prose and poetry, in both Irish and English. Her books explore birth, death, desire, and domesticity. Her awards include the Rooney Prize for Irish Literature, a Seamus Heaney Centre Fellowship, the Ireland Chair of Poetry bursary, the Michael Hartnett Award, and the Ostana Prize (Italy). Doireann’s artistic practice often involves cross-disciplinary collaborations, fusing poetry with film, dance, music, and visual art, and she has been invited to perform her work internationally, most recently in Scotland, Paris, Italy, and New Zealand. She lives in Cork with her husband and four young children. 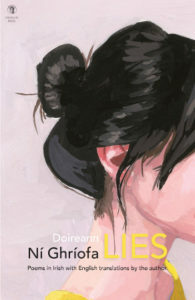 Lies, your new collection just out from Dedalus Press, is a collection of your own translations from Irish into English of work that has appeared in your three Irish language collections. My first question to you is in two parts: were you at all tempted to give over the translations to someone else or was it always your intention to translate yourself? At one point in my life, I yearned for a translator or publisher to approach me with a view to carrying my poems into English. I suppose the longer I waited, the more it became apparent to me that this simply wasn’t going to become my path. Eventually, I took it upon myself to begin translating my own poems. My aim in those early days was to translate enough of my Irish poems to be able to perform in both languages at poetry readings. The process of teaching myself to self-translate was excruciating, and I shed many, many tears of frustration. Slowly, I developed my own approach and I began to take a certain joy in the process of translating the poems into English. Looking back now, I am chuffed that I became my own translator… essentially, I became my own knight in shining armour. This book, ‘Lies,’ would never have come about if it weren’t for Dedalus Press. They published my first book of poems in English (‘Clasp’) in 2015, and have shown me great support and encouragement since. As a result of the enthusiasm of my editor, Pat Boran, I began to assemble this volume of translations. I was fortunate to have one of my favourite poets, Aifric Mac Aodha, casting her editorial eye over the original poems as Gaeilge. A dream team! The second part of that is: was it strange to translate from yourself in one language to yourself in another language? Can you tell us a little about the process? Generally (but not always) I develop a full poem in Irish first, and then (at a much later point) I begin to work on an English version line by line. It’s slow, slow work. The version of a poem that reveals itself in English is sometimes very different from the original, and yet, somehow, it always feels close to the essence of the poem, in a way that can be tricky to articulate. I learn a lot about the original poem when I set to studying it, listening to its little song, and attempting to translate it. As these are poems that have been with you for a while, did you feel like a stranger approaching them, or like someone examining an old photo of themselves? One of my favourite things about the process of assembling this book was the sense of navigating a conversation between multiple versions of myself. The ‘me’ of now was, in a way, listening closely to what a sequence of other, older versions of me had to say. Interestingly, I now have a number of harvests of translations of the same poem – where I translated it in 2014, say, and again in 2018; the linguistic nerd in me takes great interest in comparing how my different selves have approached the various conundrums of translation as they arise within the same poem. My poem ‘Míreanna Mearaí’ has hosted two very different translations to date – one in Clasp (2015) and one in Lies (2018). I’d love to make a practice of continuing to compose new translations of the original every few years; it seems to me that I am a different translator each time I have returned to this poem, and I’m curious to see how that might develop. Is the act of translation a kind of lying? Is that where the title derives from? The title is key to my approach to translating my own work. I took quite a mischievous joy in my choice to name this book ‘Lies.’ As I worked on this manuscript, I was drawn again and again to something I’d jotted down, something the American poet Lucie Brock-Broido once said: “Don’t be afraid to tell the truth, even if it’s a lie.” I’ve spent the past number of years navigating the strange relationship that can sometimes occur between reader and author, when a sense of curiosity arises about the author’s own life, and the nature of the boundaries between their life and their art. So sometimes readers will take a poem at face-value and say something like “Oh, which shop was your aunt in when she found that Russian brooch?” and I will think to myself – well, nope, that poem is a work of the imagination, the brooch doesn’t exist, and neither does the shop, the wardrobe, the brooch, the aunt. I like how the essayist Ashleigh Young put it, when she described her writing as “true-ish.” Like her, I’m more interested in the ‘ish’ bit of true-ish. To me, it seems like it’s in the ish part – that obliqueness, that ambiguity – that the art comes in. I have made of myself a servant not of the “truth,” but of the poem. In short, I enjoy how something as simple as a book title may short-circuit the presumptions that arise from a sense of biographical fallacy. Readers can sometimes assume a sense of fidelity, a perfect, scholarly mirroring between a poem and its translation, so in my roguish way, I have added some mismatches between the Irish and English versions. For example, in one poem, the time is mentioned and in Irish it’s 01.37, whereas in the English translation I made it 01.38, so these 2 versions are not even occurring in the same dimensions of time. That small detail is very telling in terms of my approach to the process of translating a poem. Since the release of Clasp in 2015, your work has become known to a wider audience. Your work is being adapted and shared in new ways – as street art and as theatre. As one of the contemporary voices working within Irish language poetry, what do you think is the state of Irish language poetry at present? And what of Irish poetry – if there is such a thing – as a whole? Irish language poetry is a very vibrant field in which to be writing. I feel exceptionally lucky to be creating new work at a time in which poets as talented as Aifric Mac Aodha, Simon Ó Faoláin, Ceaití Ní Bheildiúin, Ailbhe Ní Ghearbhuigh (and so many others) are also at work. It is wonderful and invigorating, as a reader, to witness their new poems and new books as they come into being. Equally, I read widely, and there is some very interesting English-language poetry currently being published in Ireland. As a reader of contemporary Irish poetry in both languages, I feel spoiled for choice. Finally, now with Lies out in the world – what’s next? I’m the type of writer who thrives when they have many different projects on the go, so my list of works in progress is always something to behold. The two most substantial works on which I’m focused are a manuscript of new poems in English which I’ve been working on since 2014, and a book-length book of prose, which I am deeply in love with – it’s such a hybrid oddity that it is probably unpublishable, and yet I feel compelled to write it. It’s not uncommon for me to feel baffled by the strange directions in which my writing tugs me; I just try to follow the urge, and keep showing up to fill each new page with words. Onwards!